Need an Idea for Creepy Halloween Treats? Try this yummy little treat for a scary Halloween feast . . . They are guaranteed to take a prize as the creepiest dish, but only make them if you don’t mind that no one will eat them. 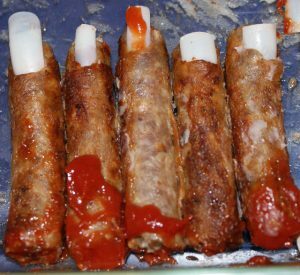 You can make severed lady fingers with sausage links, cheap fake fingernails, and ketchup. To make these, first fry up your sausages, and trim a little off of the end of each sausage for that authentic severed look, then insert fingernails into the uncut end of each sausage and drizzle the cut ends with ketchup. Disgusting!